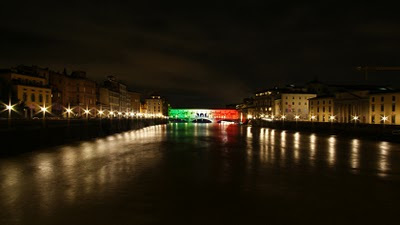 March 17 marked a century and a half of unification for the country of Italy. Surprised? Indeed, Italy as we know it has only been a country for 150 years. Before that the peninsula was comprised of a group of city-states and principalities -- not even unified by a language. To Italians everywhere, I say, "Forza Italia!" In celebration of Italy's anniversary, the city of Florence swathed the Ponte Vecchio in red, white, and green, and my friends, Massimo and Magda, were kind enough to send me a photo. Enjoy! bellissimo foto! looks a lot better than my celebration.. i will put the photos up soon! FORZA ITALIA! Hi...I'm from Russia and I had holiday in Italy with my friends. 17 march, when you have grate holiday, I had been in Firenze. It was my second visit.I like Firenze and I like Italy. Things was very nice. There was a lot of people, smile and very noisy! Super! Thank everyone!